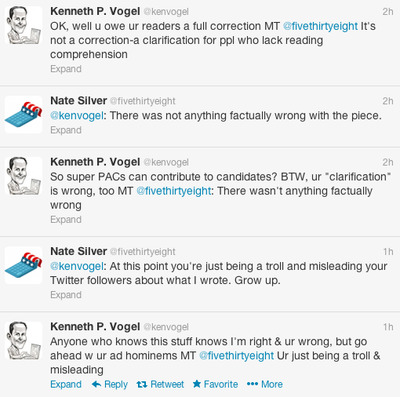 The New York Times‘ Nate Silver and Politico reporter Ken Vogel got into a substantial argument on Twitter today about a recent article Silver wrote on Karl Rove’s new Super-PAC. Vogel tweeted a seemingly innocuous observation about a correction Silver made to the piece, in which he cleared up some confusion previously in his post. In an email, Vogel pointed to a piece from the Columbia Journalism Review regarding Silver’s article. The CJR piece criticised Silver for mischaracterizing the potential effect of Rove’s new project. Its author, Sasha Chavkin, wondered whether Silver had misunderstood rules regarding Super-PACs because of two references in his piece to Super-PACs making “contributions” to candidates. Silver later updated his post and added a clarification at the bottom. 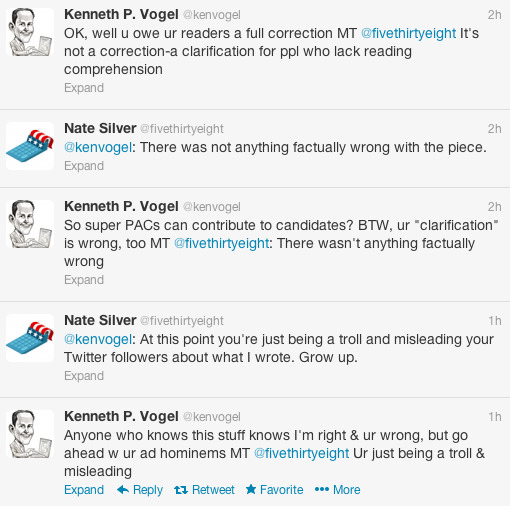 When Vogel later called that a “correction” in his tweet, though, that seemed to set off Silver. @kenvogel: It’s not a correction. It was a clarification for people who lack reading comprehension skills. Vogel didn’t take too kindly to the implication that he “lacked reading comprehension skills,” telling Silver that he owes his readers a full correction.